Fluency Backup provides a secure solution for backing up your data to a cloud-based platform and synchronizing changes made on your computer while also providing a solution to restore files when needed. To start Fluency Backup, open your Start menu and click on the Fluency Backup icon. You can also double click the icon on your desktop, if applicable. 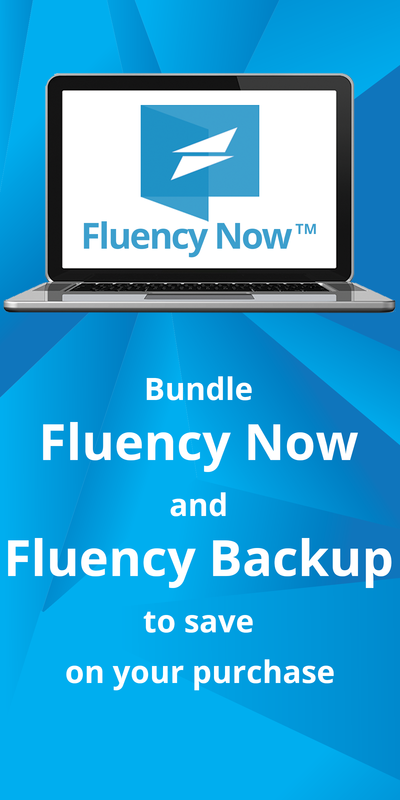 Once running, you’ll need to open the Fluency Backup dashboard to begin. To do this, locate the Fluency Backup icon in the task tray near your clock. Please note that it may be hidden; as such, you may need to click the up arrow to show hidden programs. Next, right-click on the icon and then select Fluency Backup Settings. Upon first opening Fluency Backup, you will be asked to enter a code in the license field for registration; you may also assign a password to your backup account. While this is optional, it is recommended as an added measure of security. Please note that if you assign a password at this point, it will be required when restoring your files. Once you click the Register button, you will receive notification that registration was successful. Once registration is complete, you’ll move down to the Schedule section, located below the registration section. The scheduler allows you to select as many or as few days in the week for automatic backups to occur. Beneath the set of days, set a time that you’d like the backups to begin. That’s it, now just sit back and relax because Fluency Backup is keeping your files backed up and safe so that you don’t have to. Note: Please ensure that your computer is on and connected to the internet during the scheduled backup times. To save files through the backup tab, simply click on the Browse button from the Backup Tab, locate the folder(s) you would like to backup, using the Browse button, then click OK. Save the settings for automatic backups, or click on the Backup Now button to start backing up files immediately. Check the backup results to verify the success. The restore tab enables the recovery of lost or damaged files. Here, you can restore files from a backup to their original location (overwrites any existing files), or select an alternate location for additional flexibility. To begin the restore process, you must first load the backup catalog. Note: Your password will be required if you used one during the backup process. Once this is done, select the files you wish to restore and the location which you want those files restored to. Finally, click the Restore button to begin the restoration process.